Click here for a list of things you may need for your fishing & hunting Trip. As a rule, there really isn't any difference between a Lodge, Resort and a Camp. It is usually just the name the owners have chosen - something like motels, inns, etc. These establishments consist of a main lodge facility and several cabins. There is an attendant staff to help guests with their vacation needs. An outpost is usually a single cabin that is situated somewhere away from a main base camp. Quite often, it is the only cabin on a lake and therefore, guests may find that they are the only people on the lake! There is usually NOT an attendant staff to help guests with their vacation needs. Visitors should be relatively self sufficient. Guests can drive their vehicle to the door of the cabin they will be staying in or at least to the lodge facility. Or they can fly to an airport nearby and the camp will pick them up. There are of course various packages available at drive in camps such as: American Plan, Modified American Plan and Housekeeping camps. 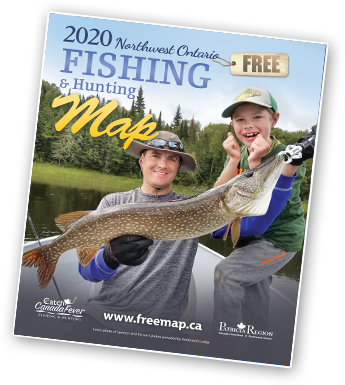 Camps are coded on the Canadian Fishing Map. A drive in outpost is simply an outpost cabin that can be accessed by road. Boat in camps bring guests in to their facility from a central landing with their own launch or the camp's boats and motors. Some boat in lodges allow guests to bring their own equipment. There are, of course different packages available at boat in lodges as well. Some offer American Plan, Modified American Plan and Housekeeping camps. A boat in outpost is simply an outpost cabin that can be accessed by water. A rail in is a camp that is accessed by train. Visitors can catch the train at any town along the train's route, and it drops you off at the camp. Packages are similar to drive in lodges. Fly in Outfitters bring guests to their facility by either wheel or float plane depending on the lodge or camp. Generally Fly in Outfitters have the same types of plans as drive in and boat in camps but there may be a few extra items to take note of such as flight weight limits etc. Prices generally include the cost of a return airfare from the outfitter's base facility. A fly in Outpost Camp is usually a cabin on a lake where guests are very secluded. Quite often, they are the only people on the lake. Boats, motors and gas are usually provided. Sometimes the staple foods are in the cabinand when guests arrive they just bring in fresh meats, vegetables and beverages. Prices generally include the cost of the return airfare from the outfitter's base facility. There are lots of choices for choosing a Canoe Outfitter. Guests may be totally outfitted or partially outfitted depending on what their preference is and also depends on the guest's experience. There are opportunities to fly in to more remote areas and most outfitters will be pleased to tailor a package to fit a guest's needs. What species of fish do you have in your lake? What species are accessible by portaging or travelling to other lakes where you have boats cached? Is there an additional cost for the portage boats? How many camps are on the lake? How much water is directly accessible from the Camp? Type of Bathroom facilities - individual? - Central? Outhouse? - Hot and cold running water? Are there Showers? - is it in the cabin or in a central shower house? What kind of Boats & Motors? Exactly what is included in the package? What time can they arrive/depart? Is there Phone/Radio communication with the outside world? What is the condition of the cabins? - they may ask to see current photos. Does your cabin have a stove with an oven?